I love sushi. 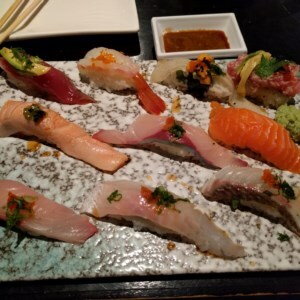 There are a wide variety of modern sushi creations such as the California Rolls, Spider Rolls, and Crunchy Rolls and well as traditional nigiri and sashimi. An in the San Mateo to Millbrae region, there are a countless number of Japanese restaurants offering sushi. The problem is most of them serve similar menus. The most popular fishes are salmon, tuna, and yellowtail. And that's perfect, unless I'm looking for a unique sushi meal that doesn't break the bank. Sushi Sam's Edomata (yelp) in San Mateo is one of the most popular spots for sushi. The chefs order their fish from Japan and they always have a variety of unique fishes depending of the time of year. This is the first place I was introduced to Copper River Salmon sushi, which is pricey, but amazing and only available for a few weeks a year. The biggest problem with Sushi Sam's is the wait. It's always long and the fancy sushi is pricey! Sakae (yelp) in Burlingame is another good option. Contrary to Sushi Sam's, it fairly easy to get a table at Sakae by walk in, but this is because the sushi here is even more pricey than at Sushi Sam's at the same quality. Amami Sushi (yelp)in San Bruno is my favorite! The prices here are a bit more reasonable (when compared against Sushi Sam's and Sakae). The wait at times can get bad, and the restaurant itself doesn't remind me of a Japanese restaurant. Instead, the focus here is on the food. They offer a $33 Omakase special that features 10 unique types of fish. This is by far their most popular dish and they only prepare a set number of this dish. There are many more Japanese restaurants in the SF Bay Area Peninsula, but these are the top 3 that come to mind.